RiPROCESS is designed for managing, processing, analyzing, and visualizing data acquired with airborne laser scanning systems (ALS systems) and mobile laser scanning systems (MLS systems) based on RIEGL Laser Scanners. Data export in geodetic systems is supported by the GeoSys Manager. RiPROCESS is project-oriented and enables the user to manage all data acquired and processed within a single project. This data includes project data, scanning system information data such as mounting information and calibration data, laser raw data, e.g., the digitized echo signals from the RIEGL LMS-Q780 laser scanner, position and orientation data from the IMU/GNSS system, intermediate data files, search tree files for fast data access, and georeferenced point cloud data with additional descriptors for every measured coordinate. RiPROCESS allows data export in the widely-used LAS format (amongst others) to execute common tasks such as classification, triangulation and decimation by third-party software packages. The included GeoSys Manager offers a powerful tool for exporting the geo-referenced pointcloud in Carthesian ECEF, geographic and local grid coordinates. 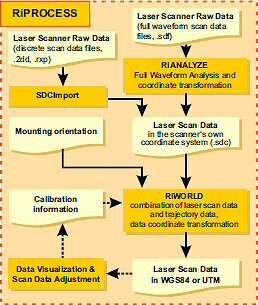 An interface to RiSCAN PRO, the accompanying software for RIEGL's terrestrial 3D scanners, allows utilizing further visualization and pointcloud manipulation tools.